Kids Day Weekend 2018 is a great time to visit the Canadian Automotive Museum in downtown Oshawa. The museum is great family fun only 30 minutes from Toronto. Don't forget to get your picture taken with Lightning McQueen! Kids Dayis a great time to visit the Canadian Automotive Museum in downtown Oshawa. Throughout the week activities and tours will entertain both children and adults. Children can make their own clothespin car craft, take home a balloon creation, enjoy automotive activity sheets, take a guided tour of the museum, and get their picture taken with Lighting McQueen. All activities are included with regular admission. No reservations necessary. The Canadian Automotive Museum's gift shop is a great place to find a souvenir to remember your trip to the museum or buy a present for a friend. 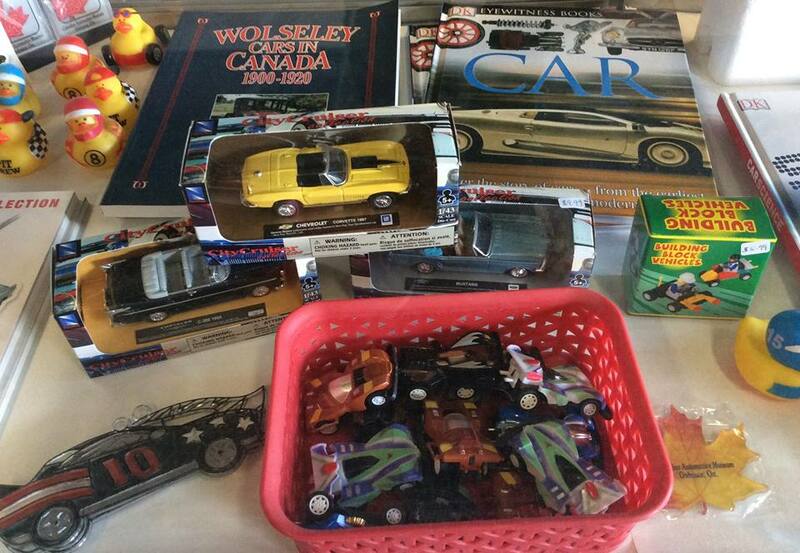 The museum has a great selection of toy cars, automotive books, posters, and souvenirs to choose from. Visit the Canadian Automotive Museum's gift shop for great souvenirs. There's tons for families to do in downtown Oshawa. Grab lunch while you are downtown at one of Oshawa's great local restaurants and head to another of Oshawa's great local attractions. Check out a list of other local museums here. Spend March Break 2018 with Lightning McQueen at the Canadian Automotive Museum. All visitors can take home a balloon creation as part of Kids Day 2018. Complimentary parking is available in the lot adjacent to the Canadian Automotive Museum. Please note that overflow visitor parking is available behind the museum on the gravel lot. Please do not park in "reserved" spaces adjacent to the museum as these are reserved for other downtown Oshawa businesses.